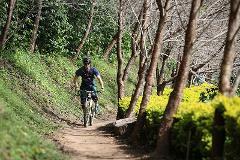 A GREAT CONDITIONING TRAIL FOR ADJUSTING TO CHIANG MAI RIDING. FAST AND FLOWY TRAILS WITH JUST THE RIGHT AMOUNT OF TECHNICAL FOR A FUN RIDE. Everyone’s favorite trail is a fun mix of singletrack, doubletrack and dirt roads that link up remote hill tribe’s villages. 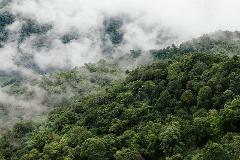 Ride through the most stunning scenery of Thai highland jungle. 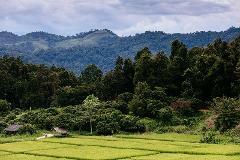 Stop for the local coffee house, overlooking the remarkable natural landscape and the view of Chiang Mai city. The variety of trails allows for moderate to more experienced riders. Challenge yourself with the punchy hill climbs and have a blast with fast and flowy trails with just the right amount of technical for a fun ride. This Buffalo Soldier is not really fighting for survival, just a stamina test as there is a good amount of climbing. Woy yoy yoy, woy yoy-yoy yoy, Woy yoy yoy yoy, yoy yoy-yoy yo! TRAILHEAD’S AWARD WINNING TOUR AT ITS BEST. RIDE DEEP INTO THE NATURE AND CULTURE OF THE NORTH. 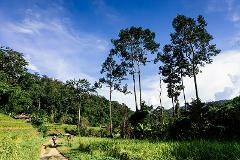 DESCEND THE UNIQUE TRAIL WITH STUNNING LANDSCAPES AND EXPERIENCE HMONG HILL TRIBE’S WAY OF LIFE. A scenic and culture journey through 16.5 kilometres of changing landscape. Ride the fast and flowy trail with some technical berms, jumps and drops. The nature along the route is simply breathtaking, from the hillsides dotted with lychee and coffee flowers to the secluded waterfall that is not accessible by other means. Ride down on switchback single track and pumping on fast double track. Soaking in remarkable view of Huay Tung Tao Lake, local’s favorite spot, with Doi Suthep Pui as the background. Round off the trip with our guide’s special treat. Truly epic MTB day out! Price does not include guide gratuity. Private groups of 6 people and more please contact us for prices and availability. Heaven for elite all mountain riders. Impressed with aesthetic and calmness of an ancient temple that hides away in the forest. Fighting against long steep climb and get the exciting fast downhill singletrack ride as a reward. Bikes. We use KONA Precept DL as standard bike for all MTB trip. This one day tour is the great opportunity to see Hmong tribe's lifestyle and culture. After visiting Hmong Village, our guide will take you up and down the mountain through abandoned singletrack, loose fire road and thrilling narrow ridge. Rural Explorer tour requires a minimum of 2 riders for departure. Solo booking will be held as Pending Booking. When the minimum number of riders is reached then you will automatically receive Confirmation Email and the payment information. THE NAME SAID IT ALL! 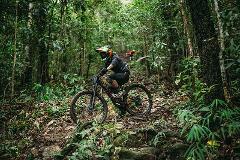 100% DOWNHILL FAST-PACED DESCENT ON MOST ADRENALINE PUMPING ROUTES CHIANG MAI HAS TO OFFER. Join us for double 100% exciting downhill trails, surrounded by the beauty of Doi Suthep Pui National Park and spectacular view of neighbor Ob Khan National Park. The first section of the day, a pure downhill trail, contains an abundance of features including smooth jumps, exciting drops, fun fast sections and challenging natural obstacles. Lunch the local food at the end of trail. We then transfer to the starting point of our final track of the day. Expect plenty of roots and ruts, a few short steep sections, and natural berms. Jump more until you’ve become so NUMB! Certainly the Numb you are looking for! 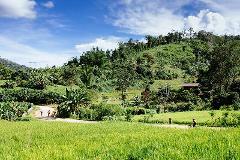 This one day tour is the great opportunity to see Hmong villager’s lifestyle and culture. This one day tour is the great opportunity to see Hmong villager’s lifestyle and culture. After visiting Hmong village our guide will take you up and down the mountain through abandoned single track, loose fire road and thrilling narrow ridge. Chilling in the fields of gold! 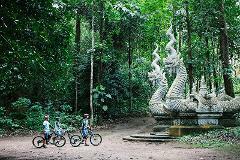 The ride that you can still have fun ridding off-road while enjoying Lanna villagers way of life. It’s best to experience the golden rice paddy in Oct to Dec.
Just a little bit off the city where many people would never notice, simple yet beautiful lives are there. Ride on and off road through local farms or rice fields where you can taste a seasonal fruit or snack, and learn the local lifestyle from friendly villagers. Fields Of Gold tour requires a minimum of 2 riders for departure. Solo booking will be held as Pending Booking. When the minimum number of riders is reached then you will automatically receive Confirmation Email and the payment information.